Pests invade homes for varying reasons during autumn and winter. Common outdoor species such as Argentine ants, Oriental (or Turkestan) cockroaches, sowbugs and pillbugs, springtails, and millipedes, may simply be escaping harsh conditions such as freezing temperatures or small-scale flooding. 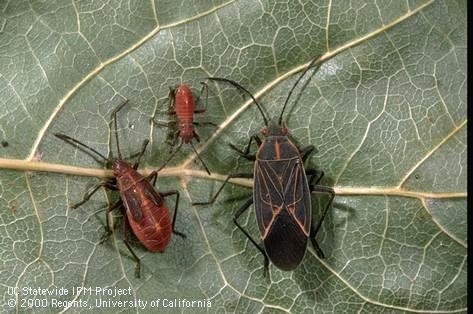 Some insects, especially true bugs (Hemiptera); such as boxelder bug (Figure 1), bordered plant bug, milkweed bug and other seed bugs, false chinch bug, and various stink bugs, naturally seek out dry, protected cracks and crevices within which to spend the winter. In the landscape, such sites may be beneath loose tree bark or deep within firewood piles, but structural gaps, cracks and crevices may be warmer, drier, and thus even more attractive to these overwintering bugs. Figure 2. Brown marmorated stink bug adult (top) and nymph (bottom). 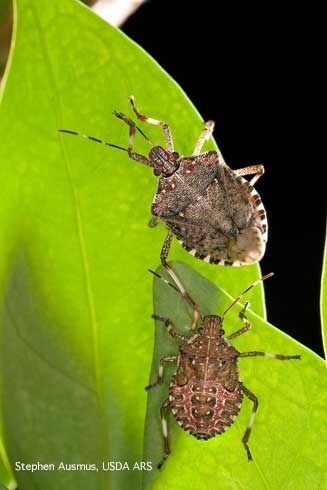 Two relatively new invasive stink bug species, the bagrada bug and the brown marmorated stink bug (Figure 2), established in many urban and suburban areas throughout the state, may build up large populations since they lack specialized natural enemies in California. Many of these bug species aggregate, or form large groups, within their winter harborages. Some lady beetle (lady bug) species, important predators in the garden and landscape, also form such overwintering aggregations in sheltered locations. 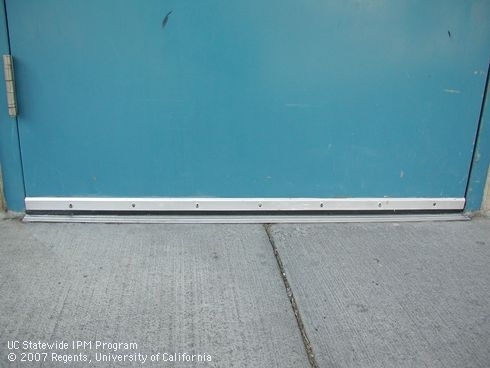 The best way to prevent nuisance pests from invading structures is to exclude them by sealing up possible entry points. To keep pests out, special attention should be focused on doors, windows, foundations, chimneys, roof joints, shingles, vents, and conduit ports. 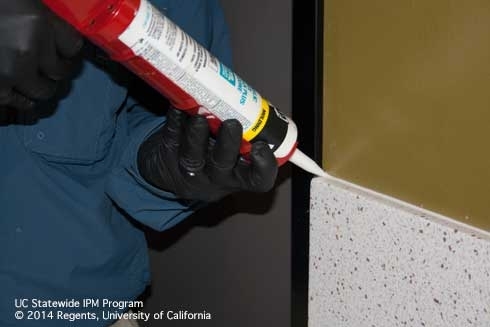 Door sweeps (Figure 3) and threshold seals can be installed to eliminate gaps under and around doors while new screens, weather stripping, and expanding foam may be necessary to seal up gaps in and around windows. Instruct your customers to seal up all cracks and openings on the outside of the structure, using appropriate sealant materials for the site and situation. These materials may include mortar and cement products (for hardscape gaps), roof cement (for sealing chimney flashings), elastomeric sealants (for large gaps at joints subject to movement), expanding foams (for hard to seal gaps and for conduit ports), and caulks (for small gaps and joints where no movement is expected) (Figure 4). Figure 3. Install door sweeps to keep pests out. It is also important to eliminate landscape conditions that may favor pest presence and buildup. Certain plant species may serve as food sources for true bugs in the summer and fall, allowing populations to build up locally; identify these plants and remove and/or replace with alternative species. Eliminate excess moisture near structural foundations and entryways, and reduce potential pest habitats, such as thick vegetation, wood chips and other organic mulches, and firewood piles, by moving them at least one meter away from structural perimeters and entryways. Teaching your customers about structural exclusion and habitat modification techniques for management of seasonal nuisance pests will promote sustainable and long-term pest prevention while protecting their homes, communities, and environments from unnecessary pesticide applications. By steering them towards the right products and approaches you will build customer satisfaction and loyalty for years to come. For more information about managing specific pests, see the UC IPM web site. To read additional guidelines for how to design or build pests out of structures, see the publication Pest Prevention by Design. Figure 4. Use caulk or sealant to block small openings.